The Gulls clinched the National League South title with a 2-0 win over Eastbourne, leaving them 10 points clear of Woking with three games to go. Goals from Connor Lemonheigh-Evans and Jake Andrews made it 26 wins for Torquay, who have scored 88 times. The Devon side took nine points from nine games before Johnson took over. Defeat for second-placed Woking at play-off chasing Chelmsford meant Torquay will return to the National League, where they played between 2014 and their relegation last season. After securing the seventh promotion of his coaching career, the former Yeovil boss told BBC Radio Devon: "The boys were buzzing of course and they were absolutely ecstatic with getting champions so early. There's no pressure now going into the last three games." The 63-year-old joked that his squad were not used to celebrating. He said: "A few of them showed their inexperience of winning trophies and winning leagues where they couldn't get the corks of the champagne bottles properly and they didn't know how to shake it properly." He will hope to continue the winning theme next season after a tough few years for Gulls supporters who have seen a number of different owners and managers come through the doors. 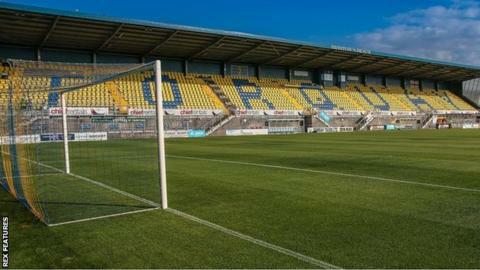 Businessman Clarke Osborne, who took over the club at the end of 2016, has faced criticism over plans to move Torquay to a new stadium by 2020, but form on the pitch seems to have revitalised the Yellow Army faithful. Johnson's success has boosted the crowds at Plainmoor from about 1,200 towards the end of previous boss Gary Owers' regime, to 4,000 on 26 December when the Gulls hosted Truro City. The club took more than 2,700 'away' fans when the two sides had their reverse fixture on New Year's Day as the Cornish side, who were groundsharing at Plainmoor, were technically the home team. Torquay forward Jamie Reid told the club's Twitter account: "After a few years of upset and tough times, it's good to put smiles on a few people's faces."